Q: Do you really need to add EcoBoost? What is the best way to apply it? A: If you want to get the most out of your beneficial bacteria, control excess amounts of nutrients and have a pond full of healthy fish, you need to add Pond Logic® EcoBoost™ to your maintenance routine. Think of it like a multivitamin for your pond; it enhances what you already do to create a clean, clear ecosystem. Here’s what you need to know about the benefits of EcoBoost™ and how to effectively use it in your pond or lake. EcoBoost™ has three main functions. It binds excess phosphates, enhances the growth of natural bacteria and adds trace minerals that fish need to thrive. Phosphates – which enter a pond or lake via lawn fertilizer and storm drain runoff – can wreak havoc in an aquatic ecosystem. They act as algae and aquatic plant growth steroids, causing algae blooms, weed proliferation and muck buildup. If left untreated, the result is oxygen depletion and poor fish health. EcoBoost™ helps to control those phosphates, and in doing so it acts as a boost for the natural bacteria living in your pond. As the beneficial microorganisms found in MuckAway™ and PondClear™ gobble through organic debris on the bottom of your pond and suspended in the water column, EcoBoost™ binds excess phosphates and removes them from the water. In addition, more than 80 trace minerals found in EcoBoost™ promote fish health and fast growth. It’s also safe for other aquatic critters as well as horses, livestock, birds, pets and wildlife. EcoBoost™ comes as a powder that you simply mix with 2 to 3 gallons water in a pail and pour along the shoreline of your lake. You can apply it every two weeks, or on a routine schedule along with MuckAway™ and PondClear™. It has no temperature restrictions, so you can use it all year long. If you use chemical algaecides or herbicides, be sure to wait for three days before adding EcoBoost™ and your beneficial bacteria products. This spring, try adding EcoBoost™ to your maintenance routine. You’ll enjoy clear water and healthier game fish. Pond Talk: What plans do you have for your pond or lake once spring finally arrives? Q: Why is my pond cloudy in the summer and clear in the winter? A: Frustrating, isn’t it? During the summer when it’s warm and inviting outside by the pond, the water looks cloudy; when it’s too cold to enjoy the outdoor scenery, the water appears crystal clear. What’s the deal? Let’s look below the water’s surface to see what happens during the two seasons. A lot happens in your pond during the warmer months. Fish are actively feeding and creating waste. Pond critters, like turtles and frogs, are digging around in the mud and stirring up muck at the bottom of the pond. Rainstorms wash sediment into the pond along with fertilizer residue – which provides fuel to algae and pond weeds growing prolifically in the summer sun. With all that activity, it’s no wonder the water looks cloudy! During the winter, however, activity slows. As your fishes’ metabolism decreases, they fast and hibernate through the cold season. Turtles, frogs and other pond residents reduce their movement, too, which allows the muck and sediment to settle at the bottom. Ice and snow cover the pond, limiting water movement and blocking sunlight. Algae still grows, but at a much slower rate. As everything settles and slows down, the water clears. Feed Your Bacteria: First, be sure to add some bacteria enhancer, like EcoBoost™, to the water. It binds suspended organics, provides trace minerals to fish and other pond dwellers, and helps break down fertilizers from rain runoff. It has no temperature restrictions, so you can use it throughout the seasons. Shield the Sun’s Rays: Next, pour some Pond Dye in the water. The color reduces the amount of rays that into the pond. Like EcoBoost, Pond Dye has no temperature restrictions, so you can use it throughout the season. Add Oxygen: Aeration is the final – and most important – step in maintaining clean, clear water. By aerating your pond from the bottom up, you will circulate the water, improve the dissolved oxygen levels in your water column, and allow for increased levels of beneficial bacteria to accumulate in your pond. 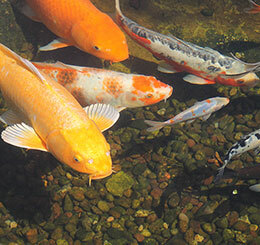 Pond Talk: How do you keep your pond clean and clear all year long? Q: When should I start using the Seasonal Defense in my DefensePAC? A: Seasonal Defense®, contains aerobic bacteria that’s specially designed for cooler water. In the spring, it replenishes bacteria lost over the winter, jump starts the growth of the waste-gobbling microorganisms and breaks down accumulated waste. It’s a great way to kick off pond season!